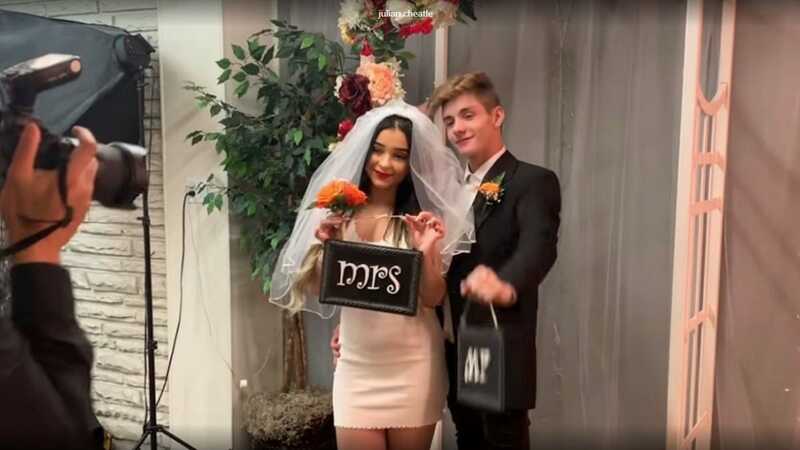 Danielle Cohn stunned fans yet again yesterday when she posted photos and video which appeared to show her getting married. The teenage social media star and her boyfriend Mikey Tua posted a video to YouTube on Saturday, April 13, in which they tell their fans that they got married in Las Vegas. Danielle also posted a photo on her Instagram, saying that the wedding took place on April 6. 4-6-19💛💍 the day I committed to my best friend. Many shocked fans expressed doubts about the young couple’s claims that they were married, pointing out that Danielle’s YouTube about page informs viewers that she is 15 years old, meaning that she is a minor. However, others noted that under restricted circumstances Nevada state laws allow minors under the age of 16 to get married and legally obtain a wedding license. In those cases, the law requires the consent of their parents or guardians and a court must approve the union. Despite the explanation that Nevada laws allow minors to marry under special circumstances, many fans continued to express doubts, saying that the pair could well be pranking their followers. Some fans argued that the couple’s social media activity suggested they tied the knot at The Little Vegas Chapel in Las Vegas, with an Elvis impersonator officiating. As well as real weddings, The Little Vegas Chapel also carries out “fake” ones. The website has a whole page listed for “pretend weddings”, with one section titled “Say ‘I Do!’ without the legal paperwork”. However, other fans believed the teenagers did get hitched for real, with many commenting “congratulations!”. The latest developments come days after an Instagram post which appeared to suggest that Danielle was pregnant, and which led to a debate about her age. The pregnancy post was also believed by many to be a prank. Her boyfriend Mikey Tua also took to Twitter to inform his social media followers that the baby was due on 14 August. Cohn followed up Tua’s tweet with a cryptic tweet of her own that appeared to echo her boyfriend’s message. Then on Friday, Tua posted a YouTube video in which he features with Danielle informing their fans that they have something to tell their parents. Cohn went on to say that she is pregnant. Daniel Cohn is currently one of the biggest teenage social media stars. She has more than 1.2 million subscribers on YouTube and 3.4 million followers on Instagram. She regularly posts vlogs to her YouTube channel in which she and her boyfriend Tua entertain their followers. Cohn is also a singer. She released a music video in March 2018 for her single Little Like Paradise. She and her Tua celebrated their 3 month anniversary of their relationship in September 2018. The latest developments come after a long-drawn debate among Danielle’s fans about her real age. Although her YouTube about page informs viewers that she is 15 years old, rumors and speculation emerged in 2018 that she is actually three years younger than she claims to be. YouTube videos began surfacing online claiming evidence that Danielle was born in 2007 and not March 7, 2004. In a video that was widely circuited among Danielle’s fans, her ex-boyfriend Cole Galotti claims that he has seen Danielle’s birth certificate and that she is younger than she claims. Cohn has responded to the speculation and rumors by posting images of herself and asking fans to judge for themselves whether she looks younger than her official age. In a 2018 interview with BuzzFeed, Danielle acknowledged that her life has come under intense scrutiny because of her celebrity status. Since she shot to stardom a few years ago, Danielle has acquired dedicated critics, some of whom have created social media pages that they use to troll the teenage star and criticize her lifestyle. But in the interview with BuzzFeed, Cohn argued that her haters were only jealous of her success. “I think I’m targeted the most due to the fact that I grew very fast on Musical.ly and a lot of people are jealous of that,” she said.